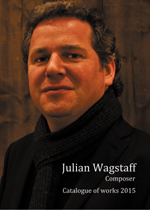 Julian Wagstaff is a composer of classical music, opera and music theatre. He lives in Edinburgh, Scotland (UK) where he is also active as a writer, arranger and guitarist. 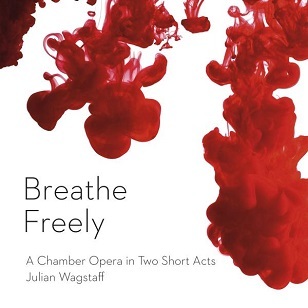 A recording of Julian's recent short opera Breathe Freely is now available on the Linn Records label. The CD was produced and engineered by Calum Malcolm, conducted by Derek Clark and supported by Scottish Opera and the University of Edinburgh. The CD also features a recording of Wagstaff's piano trio A Persistent Illusion, and is now widely available through record stores and online outlets. Julian's work includes chamber music, symphonies, songs, musicals and chamber opera and has been performed in Scotland, England, the USA, Belgium, Italy, Catalonia, Portugal, Australia, Germany, Austria, the Netherlands, Denmark and many other locations. Julian regularly works with Scotland's top professional ensembles - he has recently collaborated with Scottish Opera, Hebrides Ensemble, the Scottish Chamber Orchestra, the Edinburgh Quartet, Consort of Voices and many more. Julian is also in demand as a teacher and as a speaker, particularly in relation to his musical works informed by the natural sciences, and has run numerous successful workshops with school and college students across Scotland. This official website (julianwagstaff.com) contains information on most of Julian's music, including MP3 sound files, perusal scores and programme notes, plus links and information on past and future performances. Full contact details can be found on the Contact page. Julian writes, records and performs rock music under the name Jules Reed, including with the Edinburgh band The Firrenes. His CD Five Songs for Your Consideration is available now - click HERE for the website. Click the buttons below to browse scores and CDs by Julian Wagstaff on Amazon and Sheet Music Plus. Listen for free on YouTube or SoundCloud. Visit our partner site OperaScotland.Org today!